A few of our fellow comrades here at Lefty's attend Purdue. Here's to a good game for all, but clearly we're rooting for the Irish here! 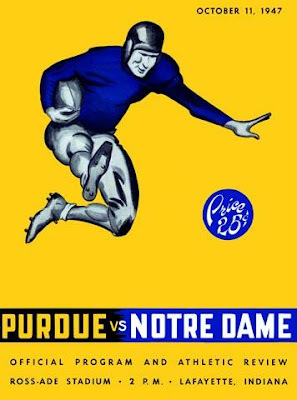 Fun fact: In the game this poster advertises back in 1947, the Irish defeated Purdue 22-7. Steve King: Most Intellectually Dishonest Congressman Ever, or Just Stupid? Now gay marriage is socialist too. 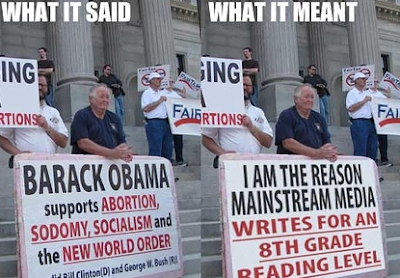 Which means that since Obama is socialist, his wife must be a man. IT ALL MAKES SO MUCH SENSE NOW. We won't even get into the fact that no, there is no real basis for objection to "group marriage" either, that it is entirely possible to construct fair legal frameworks for it should it ever become an issue, and that in the final analysis, government has precisely zero business telling free citizens how they may or may not associate. That's in that whole "Constitution" thing the birthers and deathers and teabaggers keep claiming they're "strict constructionists" of. He might as well also ban communes, which are freely associating groups of free citizens, BUT THEY'RE SOCIALIST, and thus right out as far as he's concerned. Oh, who am I kidding? Yes we will. We just did. 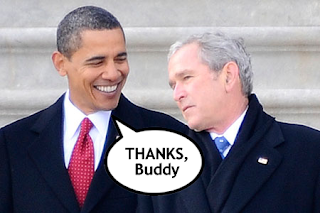 Thank you, Republicans. Thank you. Every day I wake up, I look in the mirror, and you remind me why I'm a Democrat. So I got thinking, what kind of great things wouldn't exist if it weren't for Republicans? For every Notre Dame has its USC, every Mac its PC, and every Tupac his Biggie. 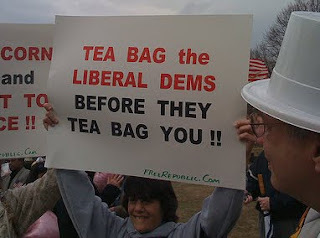 #10- Mainstreaming of words like "Teabagging"
Plus, we can't leave out classics like "welfare queen"and "states' rights." I mean, in all seriousness, who can really say they have the parity and fireworks of an American Presidential Election? Just ask anyone from one of those other 122 "democracies" who can hologram-beam a talking head straight into their news studio. Take that BBC! You brought us the wonders of The West Side Story, J Lo, and half of our local major league baseball team. ...and the Interstate Highway System. How else would Walmart get us that $3 fleece blanket during the cold South Bend winters? Just plain old wouldn't exist without ya. 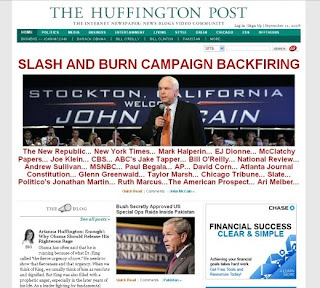 Arianna Huffington, founder of the HuffPost, was a former conservative, who rose her way to the top on the coattails of her wealthy Republican ex-husband, Michael Huffington. I'd love to think otherwise, but would America really have elected Obama if it weren't for the epic fail that was 2001-2009? I guess we'll never know. Dearest to our hearts, Lefty's Last Cry owes it's existence to Republicans. When over half of our posts thrive on your missteps and our comment wars are fueled by your intense passion, we owe it all to you, baby. Think of the insurance companies! That Stamp Will Cost You $23,000, Pal. One of the central complaints against a so-called "public option", a mechanism by which Americans may optionally purchase health insurance via the government, as opposed to private corporations, is that private insurance companies could of course never compete fairly in the marketplace against a such an ultra-efficient juggernaut. This is of course the exact opposite of conservative thinking of the last three decades, in which the government could not possibly -- could not possibly, I say! -- do anything half as competently as our private corporations, which is why everything from Amtrak to the post office has had to fight for every last scrap of congressional support, and why Social Security should be privatized and run by the titans of Wall Street, and why large portions of our wars in Iraq and Afghanistan are reliant on private companies to the tune of so many billions of dollars that nobody is entirely sure how many billions it is, any more, and is incidentally why our brave American soldiers in Iraq risk electrocution when they step into the shower. But never mind that, because if there is one thing that conservatism is truly expert at, it is telling you that anything in conservatism means the exact opposite of everything conservatism has been telling you it means for the last thirty years, and it all makes perfect sense, thank you very much, because that was yesterday and this is today, and conservatism will likely mean something else tomorrow, so don't get too comfortable with it. As such, we will happily believe that yes, everything from the Pentagon to our Social Security checks would be more efficiently run by private industry -- but there is no possible way private industry can compete with the efficiency of the federal government. And if you deduce some conflict between those statements it is possibly because you are a communist. It did start me thinking, though. Private companies like UPS and FedEx compete perfectly well with the socialist front that is the United States Post Office. How could this be? I don't have a good answer, but I wonder if they would compete even better with the government if they acted a little more like health insurance companies. The health insurance companies are operating at peak efficiency already -- we know that if they had to be any more efficient, via competition with a robust public plan, they simply couldn't function at all. So let us imagine what UPS would be like if subjected to the same masterful industry leadership. First off, if health insurance companies ran the mail service you couldn't actually expect to send mail anywhere. You would have a list of addresses it was OK to send mail to, and if you wanted to send your packages anywhere else you'd have to deliver it your own damn self. If health insurance companies ran the mail service, you wouldn't know what it would cost to mail a package, because nobody involved would be able to tell you, even if you spent the better part of a week on the phone with them. You would know what it cost you one only after you received the bill for mailing it. This bill would come one month later, but additional charges would be added a month after that, more additions would come two months later, the total would be revised again in four months, and would be adjusted again after six months. If you want to complain, knock yourself out, but chances are you won't even remember what it was you mailed back in the summer of 2008 or whenever-that-was. If health insurance companies ran the mail service, it would cost you money to mail a package, but it would also cost you money to not mail a package. That'd be the fee for possibly mailing a package, in the future, and it would go up by twenty percent every year under the "just because" clause of your contract. If health insurance companies ran the mail service, your contract to have packages delivered would stand a chance of being revoked if you actually mailed one. If health insurance companies ran the mail service, between twenty and forty percent of packages simply wouldn't arrive at their destination because delivering them wouldn't be cost effective, so bite us. And your package delivery service wouldn't just idly sit by and send what you wanted them to send. They'd tell you want you wanted to send. Flowers are nice, but couldn't you just send a card? Cookies are a bit much, don't you think? If health insurance companies ran the mail service, sometimes you'd ask to mail a package to your aunt in Philadelphia but instead you'd be told you had to mail it to her in Chicago, because Philadelphia would cost more. On the bright side, it'd be good for her to get out of the house more often. Your aunt couldn't just get the package, in any case. That requires a separate form. No -- I mean this other form. And you need to fill it out this way, not this other way. And now it's two days late, so everything is cancelled and we're taking your package, the one that we waited six months to deliver anyway. The cookies were stale, by the way, so try harder next time. Of course, all this is nonsense, because you can't really make credible comparisons between delivering a package and providing a service that has responsibility for the health and welfare of every person in the country. Delivering packages is important. As many of you know, I had to step back from blogging this semester because of an internship I have. Heartbreaking as this may be for me, I've still been doing some of my editorial duties behind the scenes. I just wanted to come on today and say a big "Thank You!" to everyone who has stepped up to keep the content on Lefty's fresh, substantive and hilarious as always. You've made my task as an editor much easier by not requiring me to chase you down on campus and beat you over the head with a blunt object to get you to post. So, once again, thank you to all our current writers, old and new, who make this site what it is. Our traffic has been picking up substantially over the last couple of weeks, and this is because of you! Keep up the good work! On another note, it is Sunday. And while many of you are familiar with our Sunday Funday features, we haven't had a whole lot of them lately, because I used to do a lot of those as well. And while I still can't post my politically related snark that used to make Sunday on Lefty's so enjoyable for me, I thought I'd renew my "Sunday Evening Tunes" feature this week with a video from my favorite band, Muse (note, Bill posted the last few SET features, which were pretty rad, featuring the likes of Godzilla & Tay Zonday, thanks Bill). I'll probably keep this up every week since I'm suffering from withdrawals from not being able to post anything about politics. This helps. This is the video for "Uprising," the first single from Muse's new album "The Resistance," which came out last week and I highly recommend to everyone.